We are very excited to announce that seminal network music band The Hub will be giving a special performance at NMF 2013 on Saturday 23rd February 2013, 7pm. 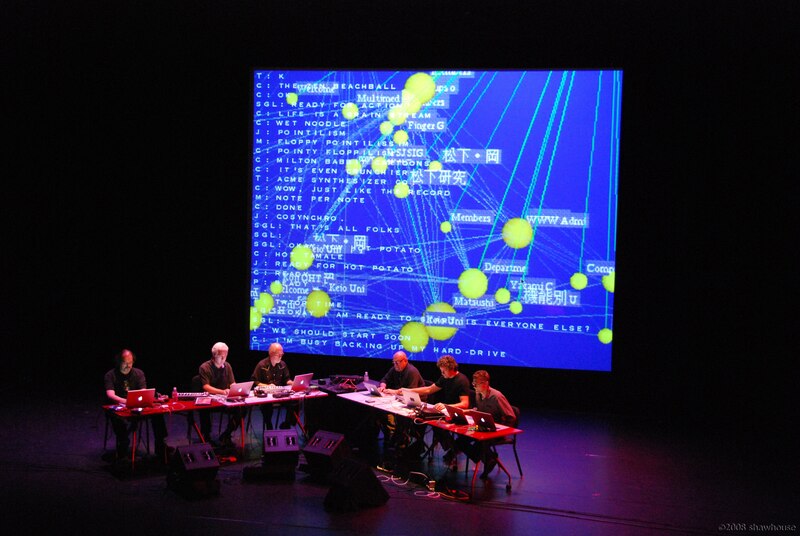 Computer network music, as practiced by The Hub over the last two decades, is characterized by the sharing of digital information via a network, which is used to algorithmically influence the music played by each player in the group. This form of interaction provides the opportunity for composer/performers using computers to use the unique attributes of this instantaneous sharing to create new ensemble relations. The musical behavior that results when each performer individually creates their own realization of a data-sharing specification in a variety of computer music languages affords a rich and unpredictable environment. Emergent behaviors and inexplicable synchronicities abound, and are used to enhance a collaborative, and improvisational performance practice. Their festival performance will include recent group configurations featuring spectral analysis of acoustic objects, room resonance as a data source, as well as hyper-improvisational mapping of shared values among other schemes. The third Network Music Festival will take place in Birmingham (UK) on 26-28th September 2014. Exploring innovative digital music, art and research which investigates the impact of networking technology on musical creation and performance practice, Network Music Festival presents a weekend of cutting edge and hi-tech musical performances, installations, workshops and talks. Network Music Festival 2014 is hosted in Digbeth, at the centre of Birmingham’s creative and digital quarter.